Google finally launched the new version of Android, and it’s officially named as Android 8.0 Oreo. The company had decided to make the launch on the day of solar eclipse, and as the solar eclipse arrived over the New York city, the place where Google held its launch live stream today, the Android O was launched. It has been a tradition for Google to dedicate the names of Android versions to sweet treats whether it be the Android 1.5, aka “Cupcake,” released back in 2009 or Marshmallow (6.0) which was the last branded release. Now one of the most favorite cookie is the new Android release. It might take time to reach the latest update on your device, but it’s worth reading about the new features of Android 8.0. This is not a big upgrade of the OS, but still there are some notable updates which you must know before it reaches your device. Some of the noticeable features are picture-in-picture, Autofill, adaptive icons, Wi-Fi Assistant, new emojis, battery performance, smart text select, and Instant apps among others. 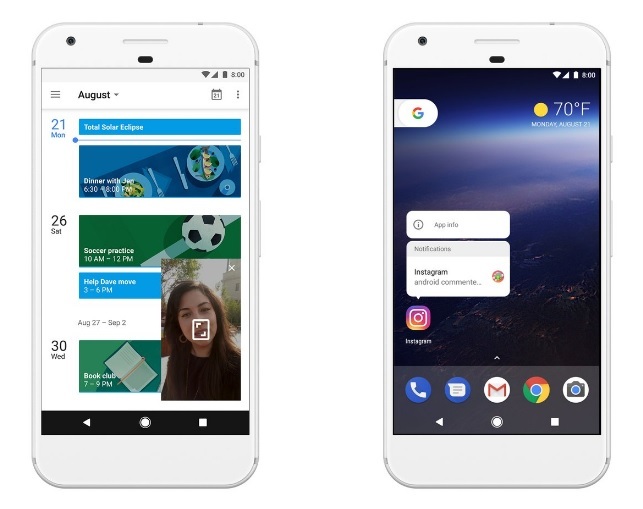 Picture in picture (PIP): If you’ve used Google’s Duo calling app you then you’ll easily understand the picture in picture feature. It allow users to perform two tasks simultaneously. For example, if you’re watching a on YouTube or on video player and suddenly remember you forgot to write an important note then picture-in-picture feature will let you write a note on notepad without having to close the video. The video will shrink into a movable window, which you can later make it full screen once you’ve done your work. Notification Dots: It’s a new feature to check app notifications, instead of pulling down the status bar. Now dots will appear nest to an app having pending alerts, clicking on the dots will bring you the notification and and then take action quickly. Auto-fill: This is a feature you might aware if you use Google Chrome. It saves time by auto filling the details on the same device, so you don’t have to fill again and again. Once you start filling the details like username, password, address, credit card number, etc you’ll be prompted to auto fill. It will also support third-party services, so you can use it on social media or other places to auto fill the details. Wi-Fi Assistant: This feature allow you to automatically connect to high quality open WiFi, or a network your device already know, such as your home. So, if you are out of home and disabled the Wi-Fi, coming back will auto enable and connect to your home network. New Sets of Emoji: Google has completely redesigned the existing emojis which are now more cartoonish, and added over 60 new emoji. Battery Performance: Android 8.0 limit the battery drain caused by apps not running at the moment (background apps) such as social media apps as they run in the background and eats your memory and battery. The battery menu has also given a new look which now shows more activities your battery is involved in. With the launch of Android O, Google has also announced the devices which will receive the update first. The update will be rolled-out in phases, starting with Pixel and Nexus 5X/6P, alongside Pixel C and Nexus Player. Other OEMs, including Huawei, HTC, Kyocera, LG, Motorola, Samsung, Sony and Nokia will be updating their devices later. These companies have their own schedule for the Android 8.0 release.